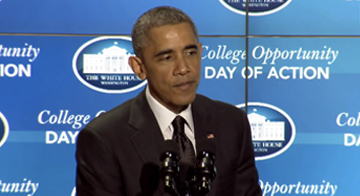 President Obama hosted his 2nd annual "college opportunity" summit today in DC. If you want to know what went down at the event, you can watch the 4 1/2 hour video below. Or if you don't have that kind of time, you can read this great analysis of the event that @alliebidwell wrote for US News. As Bidwell writes, President Obama used the event to announce that his administration would expand an Americorps program, where corps members mentor low-income students who want to go to college. He also announced a $10 million investment over the next 5 years to research better college prep and completion strategies. It seems to me – and you're going to be angry with me, college presidents – you've got to do something about escalating college costs. You guys are still way, way, way ahead of the curve, in the wrong direction. Read the full article over at US News, and let us know in the comments section below. Do you think the president is doing enough to improve college opportunity in America?